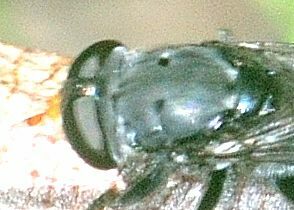 This page contains pictures and information about Drone Flies in subfamily Eristalinae that we found in the Brisbane area, Queensland, Australia. 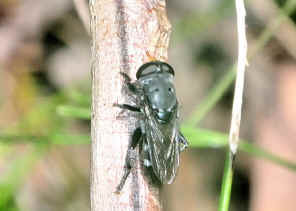 Eristalinae is a large subfamily which include different tribes. 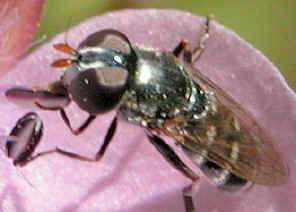 Those hover fly in different tribes look very different and have different habitats. They are from small to medium in size. 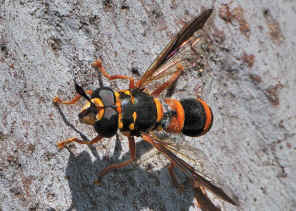 Some have mimic colours (Batesian mimics of Hymenoptera) makes them look like bees or wasps while some others have slender body. This subfamily has the widest range of larval habitats. 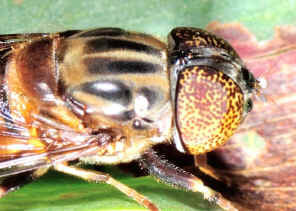 Most Eristalinae larvae are saprophagous. They live in sap trails, under bark, in rot-holes in trees and in decaying organic material such as dung and compost. Some live as scavengers on the remains of insects and other material. Others are leaf miners, tunnel in stems and root. Some are specialize on wax-secreting aphids. 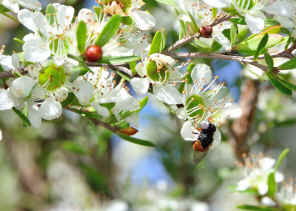 Some are parasitoids in wasp or bees nests. Pictures were taken in Karawatha Forest near the Lagoon on Sep 2010. There were a few of them on a large gum tree trunk. They rested on the tree trunk and dip its abdomen on the bark surface regularly, seemed putting some invisible marks on the tree trunk. We did not know what exactly they were doing. We have more information on this page. 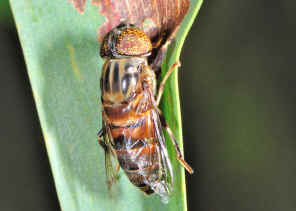 The hover flies in this tribe are medium in size. They have scout body with black stripes on yellow colours. They resemble small bees. They are common and conspicuous. 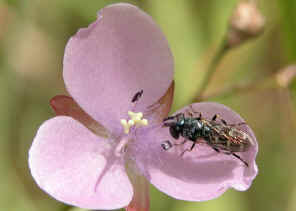 These flies are common pollinators on flowers. The larvae are known as rat-tailed maggots. They are aquatic and have a distinctive habitus. They are filter feeders in flesh waters. The larvae purify water by filtering out microorganisms and other products. - vein R2+3 sinuate, cell R1 usually petiolate. 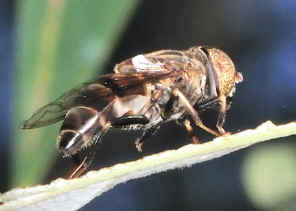 Austalis copiosa, body length 8mm. 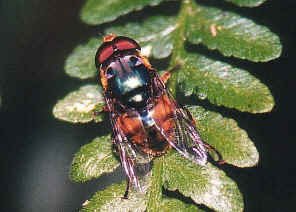 This Hover Fly is metallic green and brownish-yellow in colours. Head and legs are bright yellow. 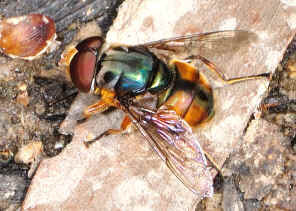 There are dark and pale stripes on metallic green thorax. The arista is bare. Wings are clear and glassy. 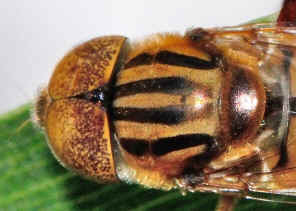 There is a board dark brown-green stripe at the middle of brownish-yellow abdomen. Please visit this page for more information. 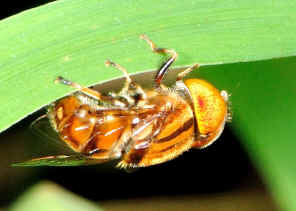 Austalis pulchella, body length 8mm. Picture taken in Alexandra Hill near the creek during early summer. Please check this page for more information. 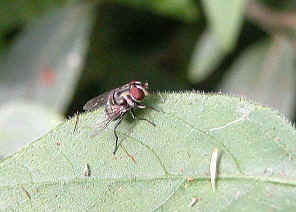 The fly was found hovering among leaves. When rest, it stay on the bottom side of leaf. There are more pictures and information in this page. 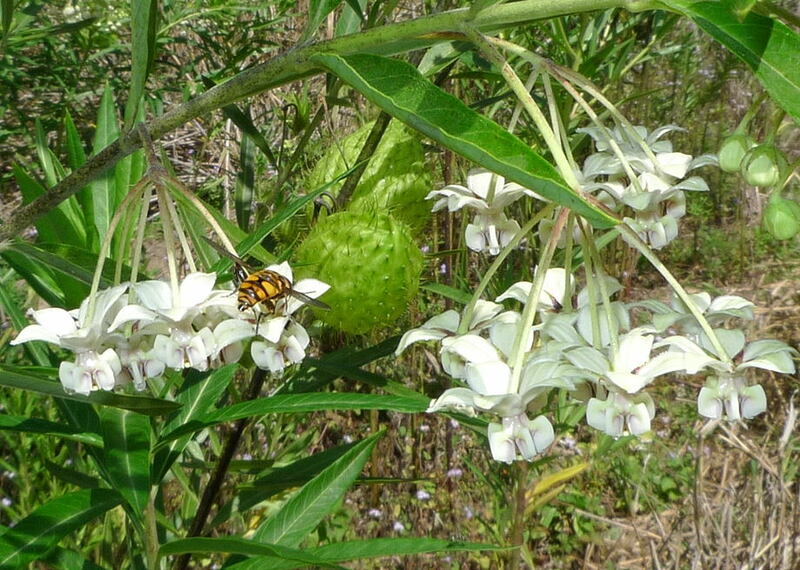 Pictures were taken in Wishart Outlook along Bulimba Creek during a very hot day in late summer. When flying the fly produced loud buzz similar to bees buzzing. More information can be found in this page. - vein R 2+3 strongly sinuate, cell R1 open. 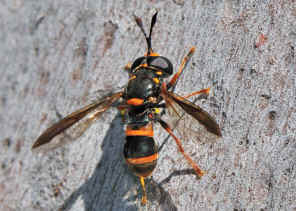 We often found this wasp-mimic fly in bush during early summer. 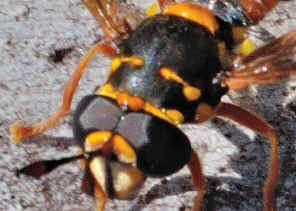 It has dark colour wings, yellow and black bands body and large eyes, the warning colours just good enough to mimic a wasp. 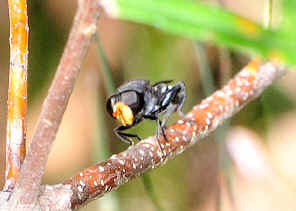 But it has short antenna, one pair of wings and those tell it is a fly. Please click on here for more information. Please check this page for more information. We found a few of them hovering near the ground. This fly has very good hovering technique. It can stay still at a single spot in air firmly for a long time, then suddenly move to another spot very quickly and stay there. Please check this page for more information. 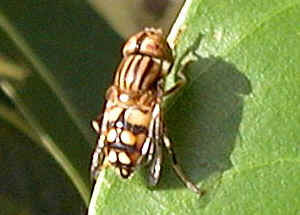 This is a small Hover Fly. It is dark brown to black in colours. 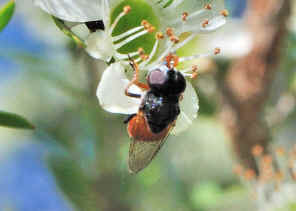 Head is black with white face and reddish brown antenna. 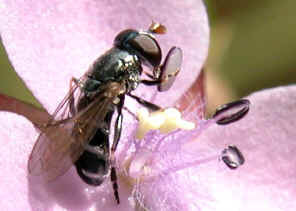 Thorax and scutellum are black. 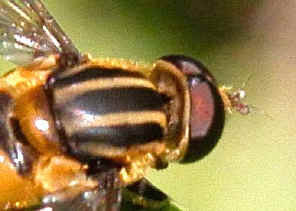 Abdomen is black with three pair of lunules markings. Please check this page for more photos and information. Pictures taken in Karawatha Forest on Sep 2010. Please check this page for details. 1. Insects of Australia - CSIRO, Division of Entomology, Melbourne University Press, 2nd Edition 1991, p763. 2. Insects of Australia and New Zealand - R. J. Tillyard, Angus & Robertson, Ltd, Sydney, 1926, p368. 3. Family SYRPHIDAE - Australasian/Oceanian Diptera Catalog - Web Version, by F. Christian Thompson & J.R. Vockeroth, 2007. 4. Syrphidae - Graeme's Insects of Townsville, Australia. 5. Northern Territory Insects, A Comprehensive Guide CD - Graham Brown, 2009. 6. Austalis, a new genus of flower flies (Diptera: Syrphidae) with revisionary notes on related genera -Thompson, F. C 2003, Zootaxa 246: 1-19 . 7. 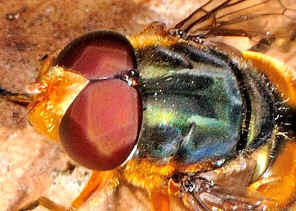 Revision of Australian Syrphidae (Diptera). Part I - Ferguson, E.W. 1926, Proceedings of the Linnean Society of New South Wales 51: 137-183 . 8. Notes on Australian diptera (XXIV), Key to Australian Eumerus species (Syrphidae) - Paramonov S.J., 1957, Annals and Magazine of Natural History 12 10: 125-128 . Last updated: February 09, 2013.